This Miami Heat roster kind of blows, doesn’t it? To clarify, Miami’s roster isn’t bad. 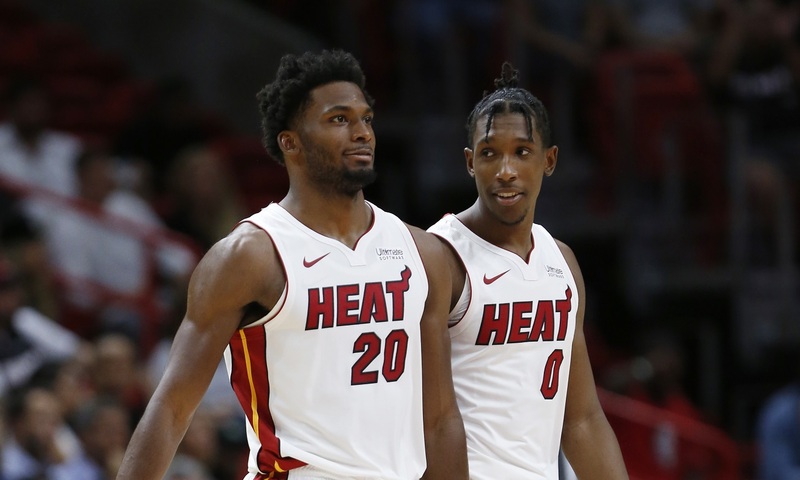 It’s headlined by fringe All-Star talent in Goran Dragic, Hassan Whiteside when he feels like it, and Josh Richardson, who is a leap away from getting there. There’s also plenty of quality role players and intriguing young prospects. An argument could be made that, on any given night, the Heat could go 12-men deep if they wanted to. This is the underlying issue to Miami being in the dreaded middle. There’s no true superstar on the team, so there’s a need for a young guy — Richardson, Justise Winslow, or Bam Adebayo — to pop to raise the team’s ceiling. But with so many guys with a legitimate case for minutes, and with so many conflicting skill sets, it’s just … tight. Richardson has been forced to play down a position. Winslow has played more power forward than small forward — or point guard, darn it. Adebayo is a 5 in today’s NBA, but he has to fight with Whiteside, Kelly Olynyk, and even James Johnson for minutes there. This is before you get into the intriguing potential of Derrick Jones, Jr.
Miami absolutely needs to make a move. For the sake of this piece, and to the chagrin of all seven of you that had to read that intro, let us assume Miami stands pat. How on earth will Miami dole out minutes? How should they? Well, frankly, I have no clue. I have not talked to Erik Spoelstra, nor would he tell a B-level punster with 37 NBA doppelgängers his rotation plans anyway. I do, however, have a few ideas about what we will see, and some lineup combinations I personally want to see thrown out there. Again, that is a small sample, mostly hampered by injuries. Richardson was hurt for a chunk of the first half in 2016-17, and Waiters had his season ended prematurely with an ankle injury by the time Richardson made his strides in the second half. In 2017-18, Waiters was pretty much a non-factor before finally having ankle surgery while Whiteside dealt with a variety of maladies. Still, if you squint hard enough, you can see why the lineup worked. At four positions, there is slightly above-average shot creation, with Whiteside operating as one of the NBA’s best (if not reluctant) rim-runners. Waiters and Johnson each have pick-and-roll chemistry with Whiteside. Inverted pick-and-rolls with Dragic and Johnson typically puncture defenses. 2. It keeps Waiters and Dwyane Wade separated. It’s just … these two can’t play together. I know the “only one ball” critique is pretty overblown. Heck, in today’s NBA, you can’t really survive without multiple creators on the floor at once. But this is just different. Both guys march to the beat of their own drum offensively, for better or worse. Putting them together is just overkill. 3. It keeps Winslow and Wade together, assuming Wade is back. Winslow looked a lot more comfortable on the floor during the second half of last season and the playoffs. That coincided with the return of Wade. In general, there aren’t many guards you’d want to be mentored by other than Wade. I do feel like the “Wade saved Winslow” narrative was a little overblown. The pairing was a net-negative (minus-2.9) in 296 regular season minutes. It was better in the postseason (plus-6.7 in 78 minutes), although Winslow’s per-36 numbers were much better with Wade off the floor (a trend that was also true in the regular season). There’s also an on-court overlap that needs to be addressed: You can’t really play those two together without high-level spacers to complement them. Still, Wade’s brain may matter more than his body here. He’s one of the best perimeter players ever. And as much as some (okay, I) rave about Winslow’s vision and craft in the pick-and-roll, Wade is still one of the best pick-and-roll creators in the league at age 36. There’s value in having those two play together, even if it doesn’t show up statistically. Here, you’d have three plus-shooters in Dragic, Richardson, and Olynyk; three plus-passers in Dragic, Winslow, and Olynyk; two quality drivers in Dragic and Richardson; and Winslow, who can get to his spots. Whiteside would serve as the rim-runner and glass-cleaner here, because duh. Having Richardson and Winslow hounding the opposing team’s best perimeter scorers is a little unfair, especially with Whiteside on the backline. That alignment would give Miami (more) opportunities to hide Dragic, something they finally started doing with regularity last season. I would be worried about opposing teams abusing 1-4 pick-and-rolls, but Richardson, Winslow, and Whiteside are all good-to-great help defenders, so that could be mitigated to a degree. We only saw this group together for 17 minutes last season. They did post a plus-9.2 net rating, but that’s not nearly enough of a sample to draw a conclusion from. We’re dealing with very tiny samples here, but that is, uh, quite a bit of variance. Waiters has, almost inexplicably, been a very good clutch player since joining the Heat. Wade is, well, you know his track record by now. We’ll see. The Heat need to see what they have in their young guys. Accelerate the curve. Give Richardson more on-ball reps. Give Winslow on-ball reps, period. Allow Adebayo to do some stuff with the ball. We’ve already seem Bam defend premier players in big moments. We can also talk about the wonky two-man game of Dragic and Johnson, as well as the defensive versatility 2 through 4. But ultimately, this is about the youth. Spo, let the kids play! Oh, by the way, this unit had a plus-22.1 net rating last year. So, you know, it’d be nice to see how it holds over more minutes. Point Justise with three high-level spacers, plus Waiters as a get-out-of-jail card at the end of the shot clock? Sign me up, please. This would obviously have to be situational — a “first-three-minutes-of-the-second-quarter” type of lineup because they wouldn’t stop a nosebleed. This is, by far, the most athletic unit the Heat can throw out there this season. There’s so much length and explosiveness. Of course, Jones, Jr. and Adebayo could also pick up four fouls in 47 seconds, rendering the experiment useless. BUT HEY. You don’t know unless you try. In general, the Heat need to be trying to carve out some minutes for Jones, Jr. There’s a two-way wing in there somewhere. Justise at the 5! Can’t you just smell the 2016 playoffs in the air? I’m here for a couple of minutes of switch-everything, attack-the-rim-at-will chaos. • A fun fact that should surprise nobody: James Johnson, Kelly Olynyk, and Hassan Whiteside played zero seconds together last season. I … kind of want to see what would happen. Throw the other Johnson and Ellington in there for spacing, then run 17 dribble handoffs in a row. • Oh, while we’re here: The Ellington-Johnson-Olynyk trio had a plus-13.5 net rating in 401 minutes last year. They should probably get more burn this season. • The Dragic-Johnson-Richardson-Winslow-Johnson lineup only played five minutes together last year. Five! Cinco! That’s arguably Miami’s best small-ball unit. • I have no clue where Rodney McGruder fits into any of this. That makes me a little sad. Looking at these scenarios it is obvious that Miami nneds to make some trades to balance the roster out. Remember the 96-98 Lakers? They had the same problems. I’m glad I ain’t Spo cause jeez, is going to be tough satisfying everyone’s minutes!! !